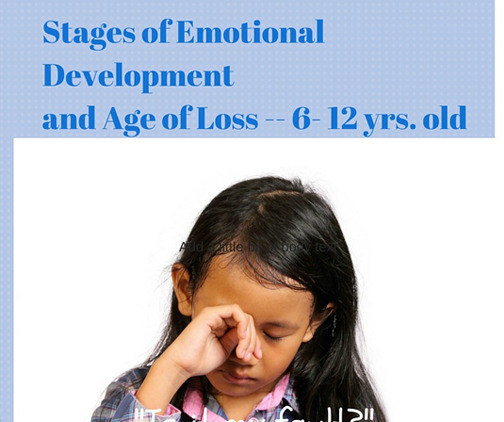 We introduced you to the Stages of Emotional Development and Mother loss in an earlier blog . Age of loss + Stage of Emotional Development + the ability of our caretaker or support system to allow us to grieve our loss = Long term adult adaptability. In other words how emotionally balanced, centered, and adaptable we are as adult. Now let’s go forward for those of you who experienced mother loss through death or absence from 6-12 years of age. The major theme for this stage is industry vs. inferiority. Experiencing loss in the 6-12 age influences Erickson’s fourth developmental stage that is critical to healthy development. During middle childhood between the ages of about six and eleven, children enter the psychosocial stage known as industry versus inferiority. As children engage in social interaction with friends and academic activities at school, they begin to develop a sense of pride and accomplishment in their work and abilities. Children who are praised and encouraged develop a sense of competence, while those who are discouraged are left with a sense of inferiority. At each stage of development, people face a crisis. In order to resolve this crisis, children and adults are faced with mastering the developmental task primary to that stage. If this skill is successfully achieved, it leads to an ability that contributes to lifelong well being. Failing to master these critical tasks, however, can result in social and emotional struggles that last a lifetime. 6-12 year olds do not have the psychological development, emotional maturity, and experience to know how to cope with a loss. A child in this age group has a basic cause and effect belief system. If something happens, there is a cause for it. When it is the mother who she loses, her cause and effect belief system tells her that she must have done something wrong because mothers do not leave their children. This is called “Magical Thinking.” She truly believes she is the cause of the mother’s leaving or death. Mothers leave children because they are bad. This belief may be the root of a life-long inferiority complex as she matures into adulthood. A motherless daughter once shared with me that her mother had died of cancer when she was 7 years old. She believes that she caused her mother’s death. At 6, in a heated argument, she told her mother she wished she were dead. As an adult, her rational side knows that she could not have caused her mother’s cancer, but her internal 7 year old, believes it to this day. She had been married three times and has been in and out of abusive relationships. Each time she experiences a loss, she believes it is always her fault and she often begs for the relationship to continue, even though it was not healthy for her. What compounds “Magical Thinking” is when these young girls are not told the truth about an impending loss or death. This may have been true for the above example. Their feelings intensify if they receive false information. Many times adults believe that they are protecting the child when they do not tell them what is happening in their world. However, the child is left to make up a story and in their story, they are the ones who caused the loss. They are not adults and do not have the emotional reserve to manage that loss. As hard as it is, the child must know the truth about the loss. It is also critical that the caretaker or whoever the support system is, to allow the daughter to grieve her loss. Sadly, that often does not happen since the adult is experiencing the grief and loss also. Women who have experienced mother loss in the 6-12 year old group are said to have the hardest time as adults. They may take on the responsibility for any loss. “It is my fault.” Some women will engage in co-dependent behavior to keep relationships from ending. Most daughters, who experience loss at this age, do not want to talk about it. They will stuff their feelings, and refuse to talk about. However, their feelings often come out in their play. A psychological coping mechanism for these girls is transference. A child who experiences loss at this age may transfer her feelings of need and dependency onto the nearest available adult. This could be a father, older sibling, aunt, teacher, neighbor, etc. The transference she uses as a coping mechanism also makes her vulnerable and an easy target for a predator. We have had many women share that this was the time when they experienced abuse from a neighbor or an adult she thought was paying attention to her need. As an adult, she will continue to search for people throughout her life to transfer her feelings of need. Another example is a motherless daughter whose mother had Multiple Sclerosis and died when she was 7. She was expected to take on an adult role, caring for her younger siblings, cooking, cleaning, and doing the household chores. This woman had to become the adult at age 7. She was not psychologically or emotionally equipped. There was no one to nurture her. As an adult, she was angry and exhibited behaviors that were overbearing, controlling, and bitter. Her relationship with her father was distant and strained as he aged. Part of her anger was pointed at the fact that he did not take care of her when she was a child and now he expected her to take care of him as he aged. She worked hard to realize that she did not have a childhood. She needed to grief the loss of not only her mother, but the childhood that she did not have. A motherless daughter who experienced mother loss at age 12, had to assume the roles of caretaker not only for a sick mother but also for her sister and overbearing, critical father. This loss has translated into an overwhelming feeling of guilt if she cannot take care of things in her life. If you have experienced mother loss from the ages of 6-12, can you relate to any of these themes as an adult? How does this play out in your adult life? Are there ways that you act as an adult that connect with these themes? Share your stories.